As we here in the states prepare for Thanksgiving, it’s already Christmastime at Walt Disney World and the resort hotels are dressed for the holidays with festive décor, gingerbread houses and more. 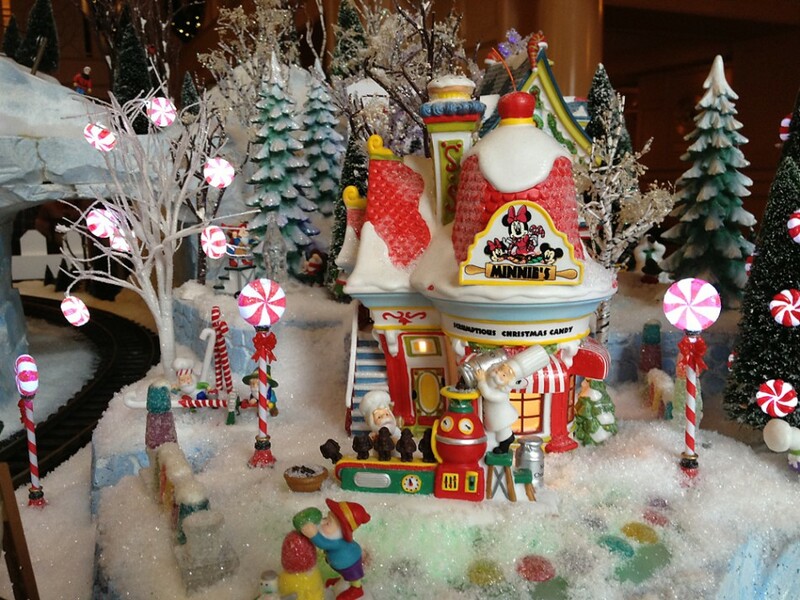 Disney pastry chefs have made things a little sweeter with deliciously decorative holiday displays and sugar shacks made of edible ingredients. 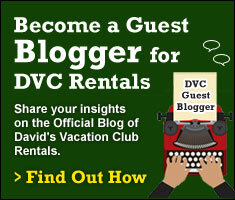 These candy-decked dwellings adorn the lobbies at several resort hotels. 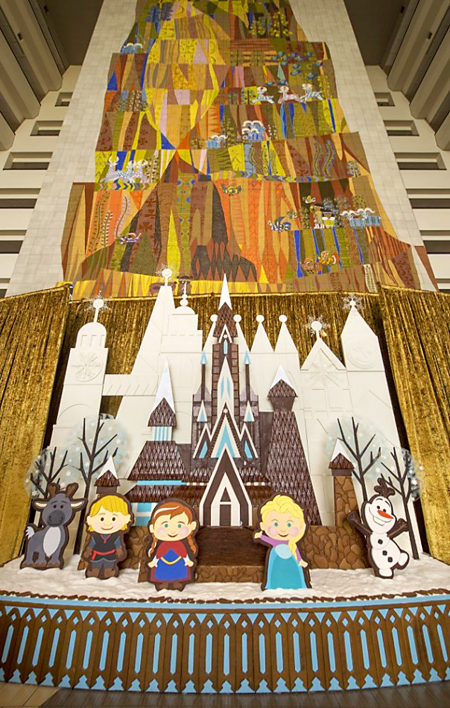 Inspired by Disney’s “Frozen” guests can enjoy an all-new Gingerbread Holiday Ice Castle on the 4th floor Grand Canyon Concourse. This culinary concoction is adorned with 1,500 gingerbread shingles, snowflakes and chocolate-covered trees. Plus, favorite characters from the film including Anna, Elsa, Olaf, Kristoff are showcased on this 17-foot-tall ice castle, including 14 Hidden Olafs. 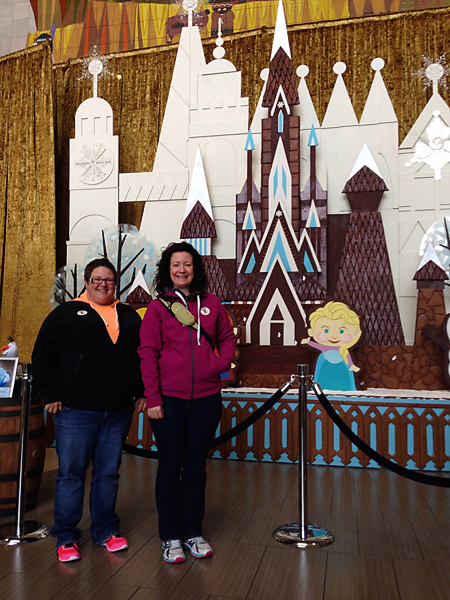 “Frozen” ice desserts, build-your-own snowman marshmallow kits, plus classic gingerbread treats are available for purchase at the ice castle kiosk by the display. This year’s creation in the BoardWalk lobby is a sweet replica of a Jersey Shore Boardwalk concession stand. The concession stand made its debut last year. 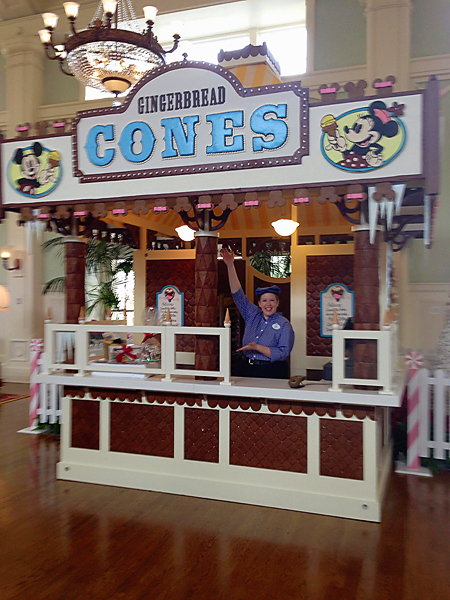 New in 2014, the “gingerbread stand” is sporting a cones theme and is decorated with wreaths made of ice cream cones. There’s a bit of Disney whimsy with Mickey and Minnie shaped gingerbread heads surrounding a marshmallow dotted marquee. 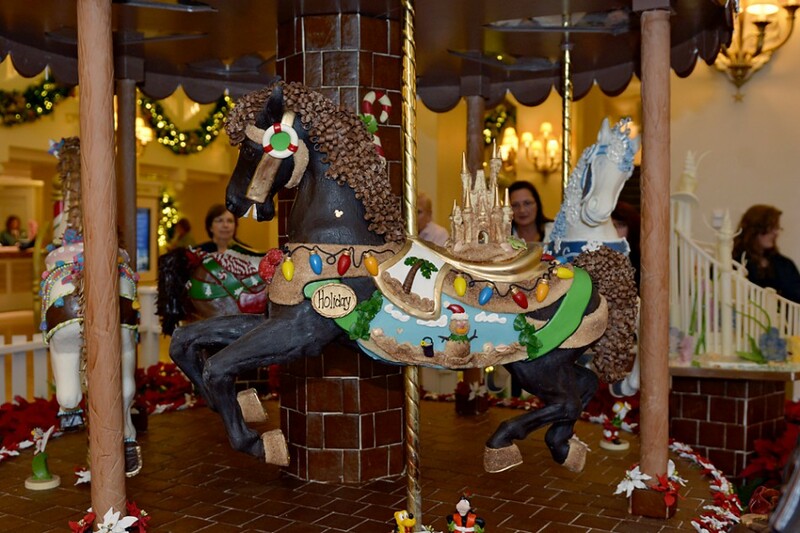 A fully detailed, life-sized carousel in the resort’s lobby was created from a recipe that uses gingerbread, chocolate, sugar paste and tons of enthusiasm, energy and talent. 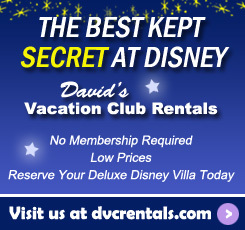 Be sure to look for the Hidden Mickeys! Guests who wish to take home a treat of their own can buy small gingerbread kits from the Beach Club Marketplace. Pastry chefs give demonstrations on select days to provide guests with tips on creating a gingerbread invention at home. 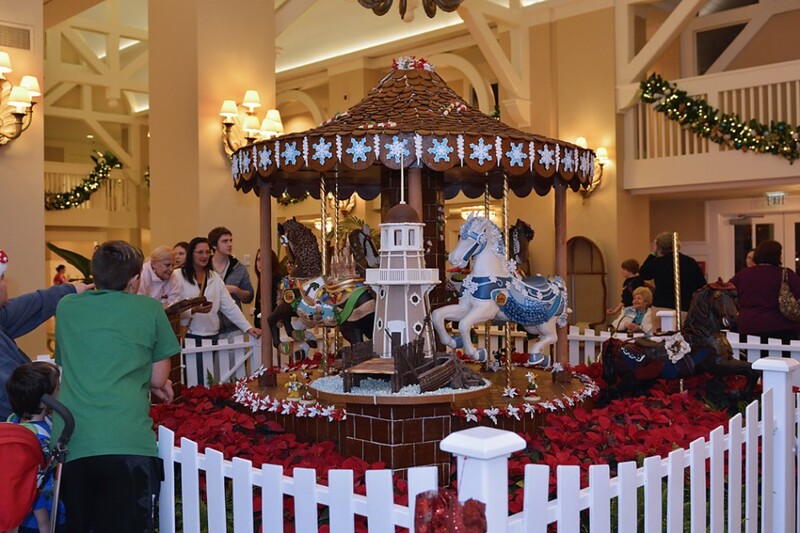 The lobby of Disney’s Yacht Club Resort has become home to a delectable scene in motion: A miniature New England-style train races through a sugary rock mountain surrounded by a candy-coated model village in this don’t-miss, edible display. 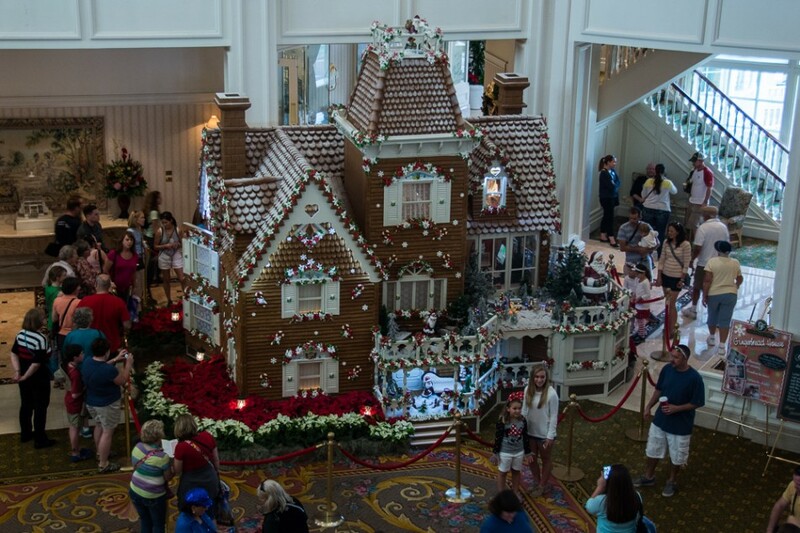 This guest favorite gingerbread house is large enough that it doubles as a real bake shop in the Grand Floridian Resort lobby. Featuring a classic Austrian gingerbread recipe, the bake shop offers freshly baked items such as cookies, shingles and gingerbread ornaments. Other homemade items for sale include Stollen Bread, chocolate peppermint bark, truffles and miniature gingerbread houses. 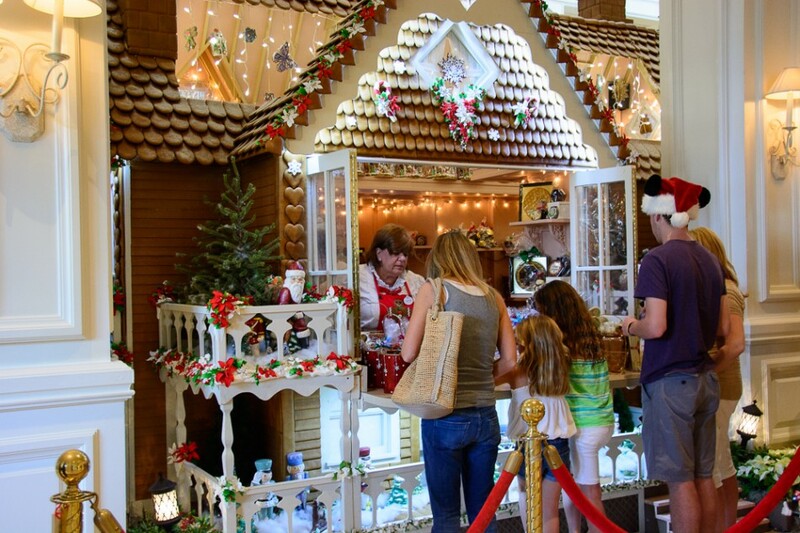 Demonstrations of how to decorate a gingerbread house take place in front of the gingerbread house several times per week. 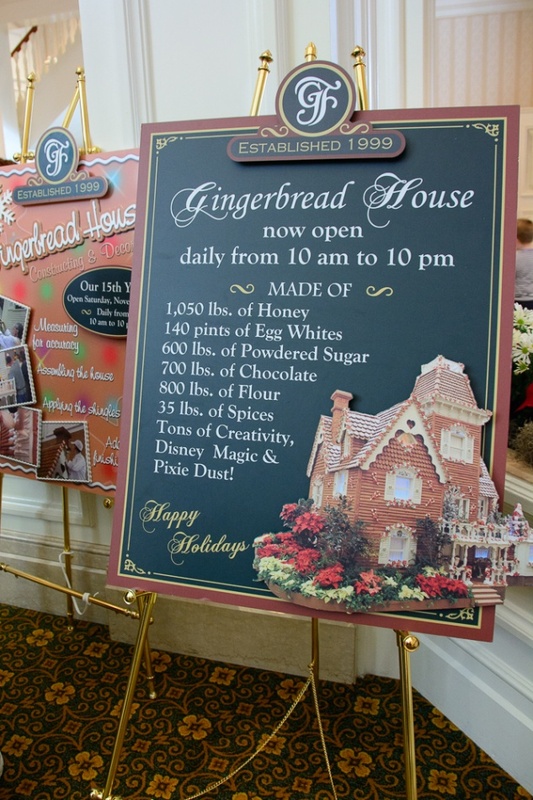 Chefs spent 400 hours baking the gingerbread and 160 hours decorating the house. The structure is 16 feet high by 17 feet wide. 10,000 pieces of gingerbread combine with 60 sheets of plywood, 40 window panes, and 1,000 board feet of trim to make this delicious abode.